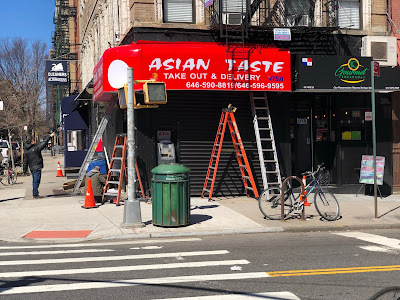 EV Grieve: The Asian Taste awning has arrived on 3rd and B; China Wok redux? The Asian Taste awning has arrived on 3rd and B; China Wok redux? On Saturday, EVG regular Salim reported that workers put in place the new awning for Asian Taste (hello Choc font! ), coming soon to the space on the northwest corner of Avenue B and Third Street. 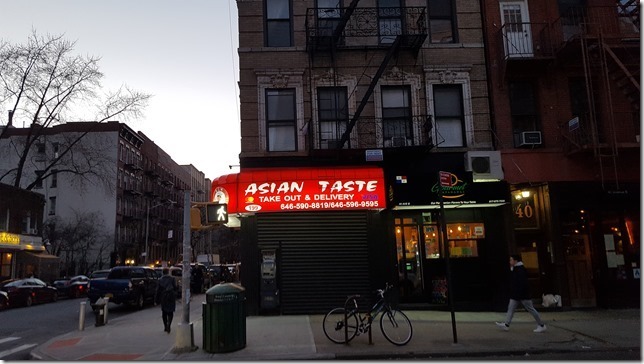 Upon its closure in December, there were rumors that the business was Cromanated via landlord Steve Croman. The for-rent sign arrived in mid-December. Whatever the case, the family felt good enough to return to this corner. Everyone should try KC Empanadas next door! And EVGrieve you should consider doing a piece on them. Really great food and exactly the type of small business everyone encourages.